ART Pro Audio ProChannel II Strip. The ART Pro Channel IIT uses second-generation discrete Class-A microphone preamp to provide clean quiet gain while maintaining incredible transparency. A powerful dynamics processor subtly controls transients and noise of the most demanding sources. The ART Pro Channel IIT's semi-parametric EQ offers wide tune-ability and can be patched before OR after the dynamics processor. 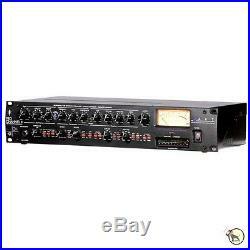 Separate rear-mounted insert points allow patching in external signal processing gear immediately after the Mic preamp and before the EQ and dynamics processor. Both analog and LED meters provide a detailed indication of audio levels. Fully Featured discrete class "A" Tube Microphone Preamplifier. 1/4 High Z input on the front panel. Smooth musical sounding Optical Compressor. Separate Attack and Release controls. Large VU and LED meters. Multi section clip monitor LED. Selectable Source switches for VU signal monitoring of any section of the unit. +4/-10 dB switch for optimal signal output levels. Toroidal power transformer for low noise. Mic: 150 to 3.4K Ohms, variable. Balanced Output: 600 Ohms balanced. Analog In to Analog Out: 12Hz to 100KHz +0, -1dB. Mic/Line: -128dBu, Input shortened, Max gain, "A" weighted. Instrument: -109 dBu, Input shortened, Max gain, "A" weighted. Mic: 70dB (XLR to balanced output). Instrument: 64 dB 1/4 to balanced output. Output Level At Meter 0 VU: +4 dBu/-10dBV. Microphone Gain: 0 dB to +56 dB. Instrument Gain: +3 dB to +50 dB. Low Cut Filter: 0 - 250 Hz, 1-pole, 6 dB/Octave. Boost/Cut: +/- 12 dB on each band. Tuning: 40 / 120 Hz Selectable. Tuning: 20 Hz to 2 KHz continuously variable. Tuning: 200 Hz to 20 KHz continuously variable. Tuning: 6 KHz / 18 KHz Selectable. Power Requirements: USA - 105 to 125 VAC/ 60 Hz. Export units configured for country of destination. Note: 0 dBu = 0.775 VRMS, 0 dBV = 1 VRMS. 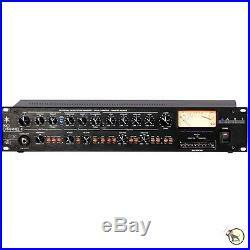 The item "ART Pro Audio ProChannel II Channel Strip with Class-A Tube Microphone Preamp Amp" is in sale since Wednesday, May 07, 2014. This item is in the category "Musical Instruments & Gear\Pro Audio Equipment\Microphones".